The most remarkable thing happened today. I was sitting on the bench waiting for my train to come, and across the railway tracks on the next platform I can see these two tweens seated facing me. They were chatting and smiling and looking my way. I had the funny feeling they were talking about me because there are no other boys on my bench and my eyes are good enough to see where they're concentrating at. I've been told that some girls would take a second look when I walk past, (although I seriously doubt that,) but I've never had girls who would look at me directly and openly. Their train came, they got on, and they're still at it, smiling behind closed doors. Now it has to be one of two things: either they really find me attractive, or there's something wrong - an open fly, some greens stuck between my teeth or something. And I'm the type of guy who would think it's the latter. So next time, stop doing that, ok? The October 2004 issue of Abbey's Advocate from Abbey's Bookshop mentions the latest book from Chuck Palahniuk. The title is Non-Fiction, and it's a collection of his non-fiction short stories. Synopsis: "Chuck Palahniuk's world has been, well, different from yours and mine. The pieces that comprise Nonfiction prove just how different, in ways both highly entertaining and deeply unsettling. Encounters with alternative culture heroes Marilyn Manson and Juliette Lewis; the peculiar wages of fame attendant on the big budget film production of the movie Fight Club; life as an assembly-line drive train installer by day, hospice volunteer driver by night; the really peculiar lives of submariners; the really violent world of college wrestlers; the underground world of anabolic steroid gobblers; the harrowing circumstances of his father's murder and the trial of his killer - each essay or vignette offers a unique facet of existence as lived in and/or observed by one of America's most flagrantly daring and original literary talents." So far, I've already read Fight Club, Survivor, Invisible Monsters, Choke, and Diary. This one should prove another must-read. I hope the local library get it soon. Captain Corelli's Mandolin was showing on TV a few days ago. There was nothing else on, so I thought I'd give this a try. Nicolas Cage is Nicolas cage. It doesn't matter whether he's a lucky cop in It Could Happen to You, or a two-faced action hero in Face/Off, or a bumbling scientist in The Rock, or a con artist in Matchstick Men. The characters change, but he doesn't. The moment he started talking with that hokey Italian accent, I just tuned out. And no amount of Penelope Cruz (with her Greek accent) can persuade me otherwise. Went to see the dentist the other day. Agenda of the day is to drill holes into my teeth, then fill them up again. He asked me if I wanted an injection. I said, what for? He said, to lessen the pain. Come again?! You want to plunge a syringe into my gums so that it won't hurt? Is that a trick question? I'm thinking, the injection will definitely hurt, even if for a bit. Drilling away those cavities might hurt. Then again, it might not. Question is, which one will hurt more? Rather than have blood spilt, I told the dentist to just skip the injection. I'm a sucker for pain, and the dentist proceeded to indulge me. John Safran vs. God had its last episode last week. Too bad. I caught it only once, and I think it's quite funny for a documentary. 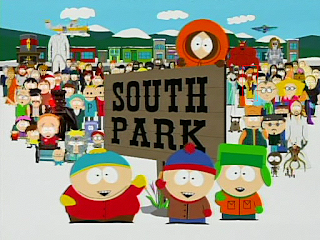 Tonight, we had the first episode of South Park's Season 8. I've seen the episode on my laptop before, but nothing beats seeing it again on the (relatively) big screen. This episode is where the South Park kids buy themselves some "ancient weapons from the Far East," and pretend they're some kung-fu Japanese anime characters. Kenny got carried away and threw a $1.99 shuriken straight into Butter's eye. Instead of taking him to the hospital, the kids glued dog fur onto Butters and told him to bark and growl, so they can take him to the vet instead. One thing led to another, and we find Cartman walking on stage naked. The townsfolk saw what happened to Butter, and they were outraged ..... at Cartman's indecent exposure. Cut to Japanese anime song. 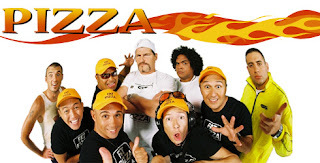 Next is the Pizza gang's crazy adventure in Rome (second to the last stop to Naples), where they search for the ultimate pizza and as usual, chicks. Google Desktop a Privacy Risk? Apparently, the Google Desktop search tool is so good, some people are now saying it's a big privacy/security risk. It goes through your Outlook/Outlook Express emals, your Word/Excel/PowerPoint files, your IE cached pages, and plaintext files, and builds a giant search index on your hard disk. You access Google Desktop the same way you would the regular Google - via a web browser. Just enter a search string and up comes the results. I was amazed the first time I saw it in action. It was able to dig up information from emails years past, and from text files and webpages I've deleted already, but still existing in the cache. Works great as a secondary memory aside from my brain. Going back to the privacy risk part. If this application gets installed in Internet cafes or Web kiosks, it will start caching the websites you've been to, the emails you've read, etc. The next user can simply type in "password" or "gmail.com" and start going through your personal stuff. So the next time you use a public terminal, make sure you disable Google Desktop Search, if it's running, and remember to clear all caches once you're done. You have Pauly, the leader of the band; Rocky, his partner in crime; and Toula, their friend's girlfriend. All Rocky and Pauly talk about is "chicks." All Toula wants are 24-hour buffets and her Habib. Every once in a while, Rocky would say, "C'mon, mayt!" And Toula says, "Omigawd! Omigawd!" whenever she's excited (or hungry). She's so gullible, the two guys take turns making fun of her. I missed the LA episode, but the Tokyo and Las Vegas ones are downright hilarious. In Tokyo, they interview the passengers in jampacked trains, and they try their luck picking up chicks at the bars. When this fails, they sing their hearts out in a karaoke joint, thinking this is how you get chicks to come to you in Tokyo. No such thing. In LA, they have target practice with Osama and Saddam, go to bodyguard school with MJ's former bodyguard, got married Britney-style, and captured a strip-dancer in action using a spy camera. It's been raining for the past few days. This after a week of record-high temperatures. Now temperatures have dropped back to the low 20's - just after we stored away all our jackets and sweaters and beanies and electric blankets and heaters. Tomorrow, it's going to be 19 degrees. The reason I hate rains is because I tend to get wet. Oh, I do have an umbrella, but I would rather not use it for fear it will get wet. I know it sounds weird, but hear me out. It's just too much hassle walking in the rain with an umbrella. Once you're indoors, you still have to find a proper spot to let it dry. And that's when I lose most of my umbrellas because I usually forget to take them back. The DLSAAA Sydney Chapter had a get-together at the Bicentennial Park today. Supposed to start 11am, but it started pretty late around 1pm already. It's a good thing my sister's classmate Emma was present because we don't know anybody else. She went with husband Andrew and her two kids. It was hot and sunny the past few days, but today the skies are overcast, and the wind was cold. That left us cold and hungry. Lunch consisted of two sticks of barbecue, a burger, some coleslaw, and baked potato. At the end of the reunion, we already knew Dickey the prez, Bert the VP and his wife, Joey the photographer/IT consultant, Luis, Jaime, and a few others. And yeah, we had some Krispy Kremes, too. Test post from email to Blogger. If you can see this, it means it works. Took my first driving lesson today. Actually, I've been driving for more than 10 years already. But I stopped for almost a year, and now I have to familiarize myself with right-hand driving on the wrong side, I mean, left side of the road. It's not as easy as I thought because I keep driving too close to the cars on my left. I accelerate even on roundabouts. I make 90-degree turns using one hand. I don't look over my shoulders when I turn. But those are just minor things. We stopped at a Stop sign, and this guy in a ute crashed into us from behind. Bang! Just like that. Good thing our seatbelts are on, and my foot was on the brakes because the impact was so great it gave me a pain in the neck (literally). The driving instructor handled everything, but still they copied down my license number since I was the one behind the wheel. Do you think they'll summon me to court? So I just sat there waiting while the passing drivers survey the damage, take note of the learner's plate, then look at me. C'mon guys, it's not my fault! Albert has certainly arrived! Imagine having my own blog. Have been putting it off for some time because I don't think there's anything spectacular happening with my life. Then again, some people report what they've eaten for lunch, and what album they're currently listening to. So I say, why not? Better to start now with whatever content that comes up, than let somebody else take http://albertching.blogspot.com.